Nobody knows what happened to Sarah Cook. The beautiful blonde teenager disappeared fifteen years ago, the same night her parents were brutally murdered in their suburban Ohio home. Her boyfriend Brad Stockton—black and from the wrong side of the tracks—was convicted of the murders and is now on death row. Though he’s maintained his innocence all along, the clock is running out. His execution is only weeks away when his devoted sister insists she spied Sarah at an area gas station. Willing to try anything, she hires PI Roxane Weary to look at the case and see if she can locate Sarah. Brad might be in a bad way, but private investigator Roxane Weary isn’t doing so hot herself. Still reeling from the recent death of her cop father in the line of duty, her main way of dealing with her grief has been working as little and drinking as much as possible. 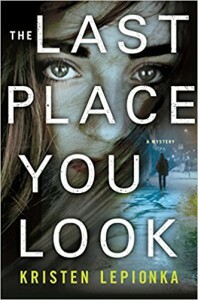 But Roxane finds herself drawn in to the story of Sarah's vanishing act, especially when she links the disappearance to one of her father’s unsolved murder cases involving another teen girl. The stakes get higher as Roxane discovers that the two girls may not be the only beautiful blonde teenagers who’ve turned up missing or dead. As her investigation gets darker and darker, Roxane will have to risk everything to find the truth. Lives depend on her cracking this case—hers included. Very much a detective novel, this book was kind of all over the place in the topics it covered but was a solid read. One of my initial thoughts about this book was "wow, this chick drinks all the time." Thankfully, while this started off as overtly descriptive, it turned into an interesting facet that allowed Roxane to grow up a little bit throughout the novel. I never really gained an appreciation for her, however, and though she was sympathetic and tough, she simply never resonated with me. I liked that her two major relationships never turned the novel into a romance but had plenty of elements of adult relationships. They were rather different in nature but each again had her maturing a little and contributed to her backstory. I really loved that she was bisexual but that she didn't have to talk about it. More so than the mystery itself, this book was driven by the relationships. She also formed a cool friendship with Shelby, a teen who managed to be caught up in the drama. It was definitely more a detective novel, but the parts I mainly cared about were by far these relationships. This book aptly demonstrated all the problems that can happen with corruption in the government and was quite alarming at some points but hopefully could serve as a wakeup call. I'm not over the top about this book and am not likely to read the sequels, but it was a fairly solid detective story.